KioskClock allows multiple employees to clock in from a single tablet or smartphone, using only 4 digit PIN. KioskClock allows multiple employees to clock in from a single tablet or smartphone, using only 4 digit PIN. This feature is perfect for any situation you would use a traditional time clock. KioskClock transforms a mobile device into an easy-to-use time clock, and can be placed in a central location so employees can easily access it. To use KioskClock, you first need to enable it for the employee that you'd like to have KioskClock permissions. 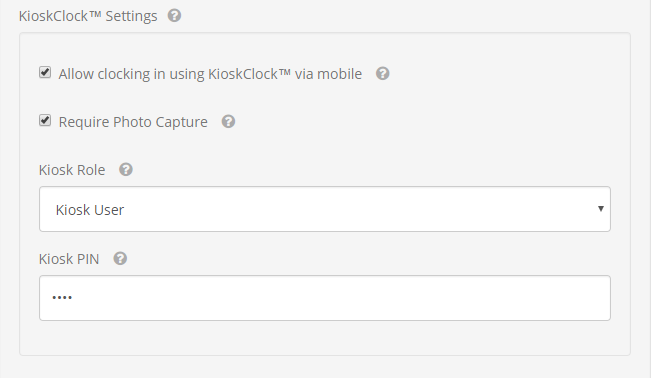 To give an employee permission to use KioskClock, visit the employee's settings via the website in the menu under Admin > Employees. 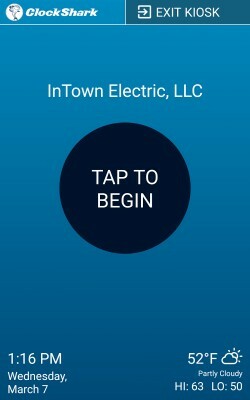 In the settings screen for each employee you will find an option labeled "Allow Clocking In Using KioskClock via Mobile". Check this box to enable the employee to use KioskClock. There are two roles within KioskClock, Administrator and User. Administrators can enter and exit KioskClock mode, while KioskClock Users are only allowed to clock in and out using their PIN when the app is in KioskClock mode. Once you’ve selected the employee’s role, finish by creating a 4-digit PIN they will use to clock in and out with at the KioskClock. Once enabled, the KioskClock Administrator may need to log out of their mobile app and log back in. 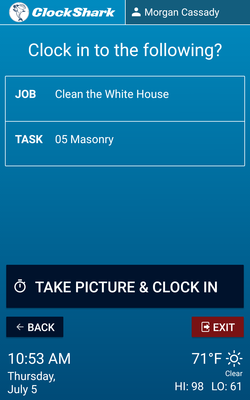 Once they log back in, they will see a new menu option in the mobile app labeled KioskClock. Note: If you have facial recognition enabled, KioskClock will switch to camera mode and photograph the employee before clocking them in. The punches will be visible in near-real time in your web-based dashboard, along with the GPS location of the punches. Whenever they need to switch jobs, or clock out, they will simply re-enter their PIN and perform that action. At any point, employees can re-enter their PIN to view their current clocked in status, switch jobs, or start their breaks. 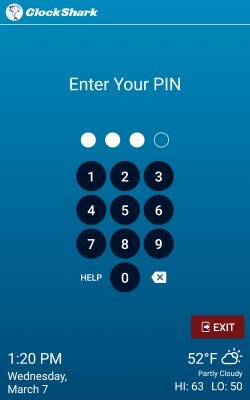 Pressing the red “Exit” button will return the KioskClock to its home screen, and allow another user to enter their PIN. To take the device out of KioskClock mode, the Administrator will press “Exit Kiosk” in the top right of the screen, and then re-enter their PIN. This will return the device to the ClockShark mobile app. Administrators can exit KioskClock while their employees are clocked in on KioskClock if they need to check timesheets or employee schedules. Be sure to check out our help page on Manager Permissions so you can enable those permissions to anyone who isn’t a company administrator. Note: Check out how to lock a tablet or smartphone so that it can only run ClockShark's KioskClock. Click here to learn how to enable this for Apple devices. Click here to learn how to enable this for Android devices. And voila! You’re now all set to go and use KioskClock like a pro! Remember: with KioskClock, multiple employees can clock into work from a single smartphone or tablet using a 4-digit PIN. This timeclock on a tablet can go in the office, at the site, or in the truck: anywhere you need to take a timeclock. 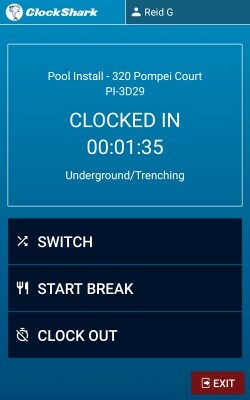 Of course, don't forget about the three other easy ways you can track employee time in ClockShark too: the mobile app, the web clock, and CrewClock.